We are very excited to announce our five selected artists for the upcoming D2P residency by Draw to Perform (27 April-11 May 2019). We are excited about this upcoming day of workshops in London with artists Echo Morgan, Ram Samocha, and Bettina Fung. Please join us in this celebration of creativity. 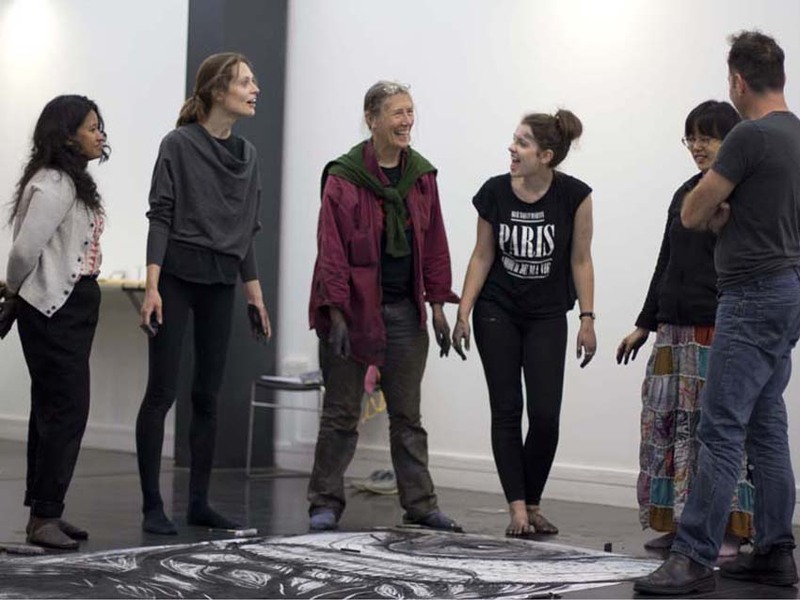 DTP in London – Day of Performative Drawing Workshops: The upcoming workshop day by Draw to Perform will include three bookable workshops about drawing, provided by acclaimed artists and performers. The workshops will explore alternative ways to make marks, draw and express. These workshops will present different strategies for forming a dialogue between drawing, sound, movement, process and performance. Participants will draw live, share and discuss their outcomes and ideas. All workshops will target different groups and issues in contemporary drawing and will allow artists the opportunity to experience an art form a first hand, work with and be tutored by some of the leading artists in their field. All workshops do not require prior drawing or performance experience. Please note Lewisham Arthouse has limited space capacity and workshops have limited numbers of tickets. Thank you Louisa Streeting for this interview about the Draw to Perform and the D2P Residency at Copperdollar Studios. The Draw to Perform residency program for Drawing Performance practice. D2P residency, 27 April – 11 May 2019, Brighton UK. Image: M.Lohrum. Photo by Manja Williams. Draw to Perform is pleased to announcea new open call – D2P residency April/May 2019. This rigorous 15 days structured programis a unique opportunity for new and developing professional artists and art students to engage in the dynamic artistic discipline of drawing performance art. For full details about the residency and open call please click on Residencies. We are so proud of this project. Thank you to all the so talented artists that take part in the first D2P residency. Thank you for all the wonderful visiting artists and workshop tutors. Thank you Copperdollar Studios for hosting this project and for Manja Williams for her brilliant photos. The open call for the D2P residency Apr-May 2019 is on its way – look soon for more info. Thank you The Harrodian School for this lovely blog review about our performative drawing workshop. This Saturday 20 Oct 2-7pm. Only in Brighton. 8 Live Drawing Performances by artists from the UK, China, Canada, Spain, the USA, and more. Free entry. We are very happy to share with you here the information about the next Draw to Perform workshops for performative drawing. Saturday & Sunday 13-14 October 2018 at 10:00-18:00 (BST). Please note that only eight places are available in each workshop. We are super excited to announce our eight selected artists for the upcoming D2P residency by Draw to Perform (6-20 Oct). The studios at Copperdollar are ready. Looking forward for things to come. D2P Residency for Drawing Performance practice. The D2P Residency program is a unique opportunity for new and developing professional artists and art students to engage in the dynamic artistic discipline of drawing performance art. The program provides the foundation to develop drawing and performance skills and to translate creative practice into live action. This rigorous 15 days structured program of mentored residency includes one-on-one mentorship, workshops, intensive studio time, studio visits and artist talks by UK drawing performance artists. The program is headed by artist and curator Ram Samocha, who is internationally acclaimed and the founder of Draw to Perform. The residency will be located in the heart of Brighton, one of the most vibrant and colourful cities in Europe and a center of creativity, vibrancy and progressive art. The program will also include guided tours to key exhibitions and art events in Brighton and London and will end with an evening of live drawing performances to celebrate and showcase the output of this creative time. We would like to take the opportunity to thank for your participation and contribution in the DRAWin festival 2018 at Fabrica Gallery. The DRAWin festival is organised by Draw to Perform, a growing art company based in Brighton, which provide a unique platform for drawing performance. We would greatly appreciate if you could take few minutes to fill a short survey regarding your experience in the Festival. We would love to hear your feedback so we can learn how to make our future events successful and inspiring. Big Thank You for all those who took part in the fifth Draw to Perform Festival – DRAWin 2018. DRAWin festival at Fabrica Gallery was a great success and well attended at all sessions. Thank you all participating artists for your contribution, your wonderful work and for sharing your talent with us: Jenny Arran (UK), Isabel The Phantomat (UK), Molly Macleod (Portugal/UK), Dejan Mrdja (UK/Serbia), Lisa Munnelly, Oli Blair (New Zealand) & Gus Garside (UK), Sidney Pink (US), Liliana Robins & Micky Bimble (UK), Fu LE (France), Ram Samocha (UK/Israel) & Mark Browne (UK), Flexer & Sandiland (UK), Kimvi Nguyen (UK/Vietnam), Jazz Moreton (UK), Xelís de Toro (UK/Spain), Carli Jefferson (UK), Liesje van den Berk (NL). Thank you Fabrica Gallery, Liz Whitehead and all assistants and volunteers, for the collaboration and for helping making this festival happen in Brighton for the second time. Thank you, South East Dance and Cass Art for your support in the project, workshops and participating artists. Thank you for the wonderful audience of Brighton for the great attendance, participation and wonderful spirits. Thank you to those who travelled from outside the UK to enjoy our festival of drawing performance. Thank you Chailey Heritage Foundation, Dorothy Stringer High School and The Process for collaborating on the enAball and workshops day for schools. Our five workshops about drawing, movement and sound for the general public featured artists, dancers, children, older and disabled people taking part and contributing. Thank you Reda Grigaraviciute for your assistance and Tom Ratcliffe for the professional technical support. Thank you Vince Blake for the sound work, Manja Williams & Vinny Montag for taking the official photos of DRAWin, for Domenico Dominelli for his video camera work, and for Janie Mo our guardian fairy. Thank you all our dear friends and family for your ongoing support. Please stay in touch and follow our future activity. Ram Samocha & the DTP team. April 2018. Please note Fabrica has limited space capacity and limited numbers of tickets. Book your tickets online now, save money and reserve your participation in this event. The Draw to Perform team is inviting proposals from artists for a drawing performance at the upcoming DRAWin festival, March 2018 at Fabrica Gallery – Center for contemporary art, Brighton, UK. DRAWin is a three-day international festival for live drawing performance organized by Draw to Perform and hosted by Fabrica Gallery in collaboration with South East Dance and Left Bank. The festival will be the fifth annual symposium held by Draw to Perform. It includes live performances by leading local and international artists, a discussion panel, and workshops for students and the general public. The DRAWin festival is a cross-disciplinary event that explores the connection between mark making, music, dance, theater and performance art. The theme this year focuses on drawing in relation to sound and movement. The festival aims to promote public awareness of this participatory and innovative practice and give the opportunity to explore and engage with it. Drawing Performance is a vibrant art form where artists creating art from mark making in front of a live audience. The art created combines elements of line, movement, space and time and is a celebration of energy and creativity. Draw to Perform was founded by the artist and curator Ram Samocha. It aims to promote drawing performance practice and share it with the audience. Since established in 2013, Draw to Perform has held four international symposiums and various other festivals, collaborations with art institutions and educational workshops. The company works with and supports international and local emerging and established artists to provide guidance, advice and mentorship services. This open call is for artists who would like to participate in the second day of the festival, the live drawing performances on Saturday, March 10th 2018 (final date to be confirmed). This year’s theme focuses on drawing in relation to sound and movement. Preferable performances should be max 15-30min long, but we open to other lengths and formats suggestions (e.g. one to one, durational, interactive performances) for the space. We encourage proposals for performances that are participatory, deal with social issues and/or confront their viewers with challenging public and private subjects. We will prioritize proposals for performances that are simple to carry out, and practical to assemble and fold. Overall ten pieces will be selected in the open call. Only 1 submission per artist/collective is accepted. – Name and contact details. – Link to website or YouTube channel. – Brief background information (100 words), including recent/current artistic work and relationship to drawing performance. – Details of proposed performance (150 words) including content, form, duration, and if appropriate, collaborators and/or partners. – Two selected images from your past performances. Submission deadline: 20 December 2017. Artists whose work is selected for participating in the DRAWIn festival will be notified on or before the 5 January 2018. Unsuccessful applications will be notified by email on or before the 12 January 2018. Please do not contact Draw to Perform regarding results prior to these dates. Contact us for a visit – the Draw to Perform workshops! 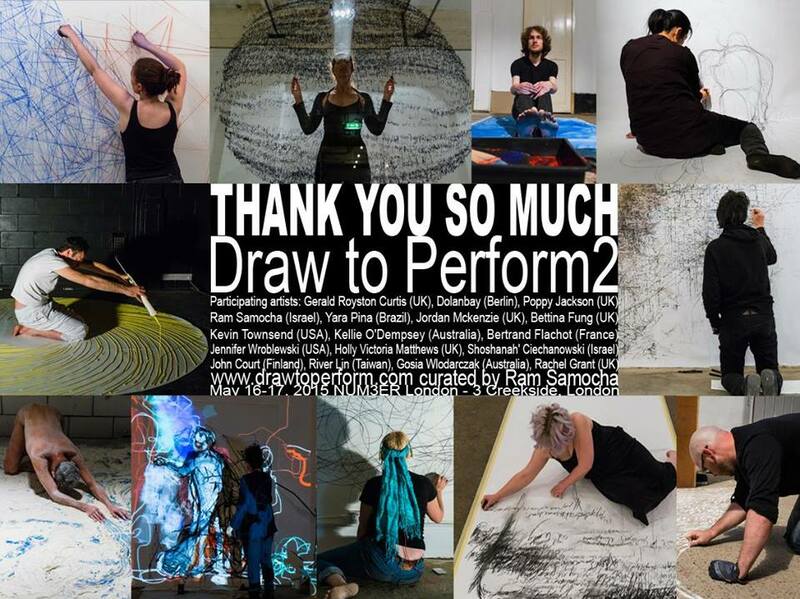 Thank you for all those who took part in the Draw to Perform symposium. Draw to Perform 4 at Fabrica Gallery was a great success and well attended at all sessions. Thank you for all participating artists: Yael Flexer and Nic Sandiland (UK), Marega Palser (UK), River Lin (Taiwan/France), Nelly Lewis (UK), Katrina Brown (UK), Ram Samocha (Israel/UK) and Paul Hartnoll (UK), Cesar Forero (Colombia/Canada) and My Johansson (Sweden/UK), Jan Rae (Australia), Fiona Geilinger (UK), Jasmin Schaitl (Austria), Echo Morgan (China/UK), Rossella Emanuele (Italy/UK). Thank you for your contribution, your wonderful work and for sharing your talent with us. We also like to thank all collaborating dancers and musicians. Thank you Fabrica Gallery (Liz, Caitlin and all assistants and volunteers) for opening your wonderful space, sharing and collaborating for the first time with Draw to Perform. Thank you, Cass Art, LIX, Austria Cultural Forum, Bundeskanzleramt;Osterreich, and NCAF for your support in the project, workshops and participating artists. Thank you for the wonderful audience of Brighton for the great attendance, participation and wonderful spirits. Thank you to those who traveled from Vienna, Berlin, Argentina, France, London and Devon to enjoy our weekend of drawing performance. Our five artist workshops featured artists, dancers, children, older and disabled people taking part and contributing. Thank you Caleb Madden for the sound work, Manja Williams and David Myers for taking the official photos of DTP4, for Domenico Dominelli for his video camera work, and for Kim Moore our PR advisor for your invaluable help. Thank you all our dear friends for your ongoing support. Participating Artists: Yael Flexer – Flexer and Sandiland (UK), Marega Palser (UK), River Lin (Taiwan/France), Nelly Lewis (UK), Katrina Brown (UK), Ram Samocha (Israel/UK) and Paul Hartnoll (UK), Cesar Forero (Colombia/Canada) and My Johansson (Sweden/UK), Jan Rae (Australia), Fiona Geilinger (UK), Jasmin Schaitl (Austria), Echo Morgan (China/UK), Rossella Emanuele (Italy/UK). RAM SAMOCHA and AGNIESZKA KARASCH talk about Draw to Perform, an International Symposium for Drawing Performance. This upcoming event will feature live performances by local and international artists and will focus on the link between drawing and painting; curated by Ram Samocha, multidisciplinary artist currently living in the UK and the founder and curator of Draw to Perform. Draw to Perform lovers – We would like to thank you all for making this amazing symposium happen. Draw to Perform3 was a complex and challenging event but also very exciting and rewarding. First of all we would like to thank you all participating artists and all collaborators for your amazing work and inspiration; for coming from all over to celebrate, drawing, and performing live. We would like to thank all the artists that sent their great work to us to be part of the screening program. Big thank you to Artcord International for donating their wonderful space for us to work at and to Jef for his kindness and attention. Thank so much Ludo for all of your support and for the videos. To Marco, Loredana, Manja, and David for your unforgettable images. Thanks for Cass Art for providing some materials for the workshops and to Kim for her ideas and for planning and helping with press and PR. Finally we would like to thank Michal for her constant hope, help, trust and love. Sat& Sun, 30-31 July 10am-10pm, Crows Nest Gallery near Portobello Market, London. Drawing performance artists from the UK and around the world are performing live at Draw to Perform’s third annual symposium on Saturday & Sunday, 30-31 July 10am-10pm at the Crows Nest Gallery, near Portobello Market, London. Day One features multiple short and long live performances, running simultaneously over 12 hours in four spaces of the gallery. This time the focus will be on COLLABORATIONS (between two or more artists, between artists and the viewers or between different art disciplines). The audience will be free to drop in throughout the day, walk around the different acts, observe and participate in some. Throughout the day there will also be lectures, video screening, and a discussion panel with participating artists. Day Two includes bookable workshops provided by international and local artists. The workshops provide the opportunity to experience the art form first hand, work with and be tutored by some of the leading artists in their field. Participants will draw live, share and discuss their outcomes and ideas. The workshops will explore drawing as performance and strategies for forming a dialog between drawing, process and performance. Drawing materials will be provided for all workshops. Day 2: Artist Talk by Ram Samocha, in the Thesis Studio, room 430 (12:00 – 1:00 pm), open to Thesis and all OCAD U students. This will be followed by workshops in the Great Hall, Thursday February 11, 1:30 – 6:00 pm. Draw to Perform visits OCAD U is a two day event, curated by Ram Samocha. Samocha is a multidisciplinary artist currently living in the UK. 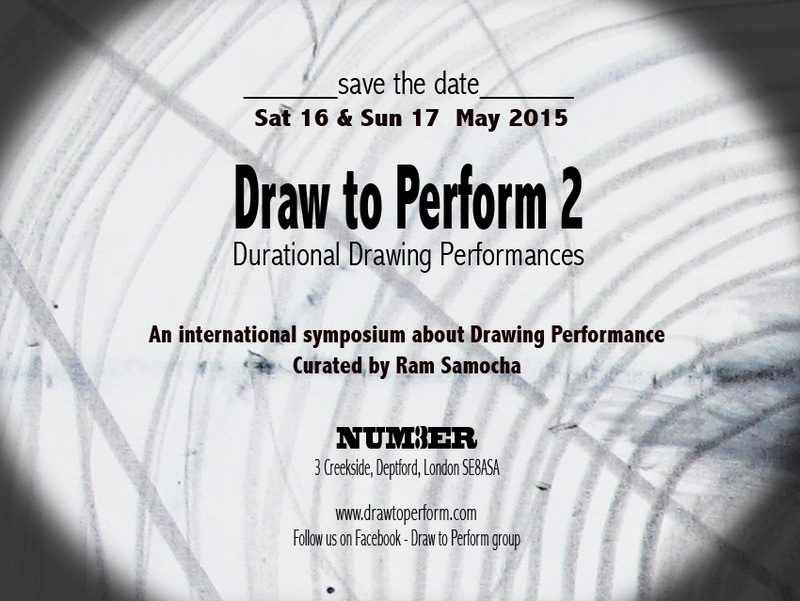 Samocha is the founder of Draw to Perform, an international symposium for Drawing Performance. Day one of the symposium will feature live performances by local and international artists. Day two will open with an artist talk by Ram Samocha, followed by workshops in the Great Hall. The workshops will explore drawing as performance and strategies for forming a dialog between drawing, process and performance. Participants will draw live, share and discuss their outcomes and ideas. The resulting works will be exhibited in the Great Hall during the Life Studies exhibition, running the same week. For the workshops, participants will need to bring basic drawing materials such as graphite, charcoals, chalks, Conté, ballpoint pen, acrylic paints, black ink, brushes, and masking tape. Paper will be provided for the workshop. 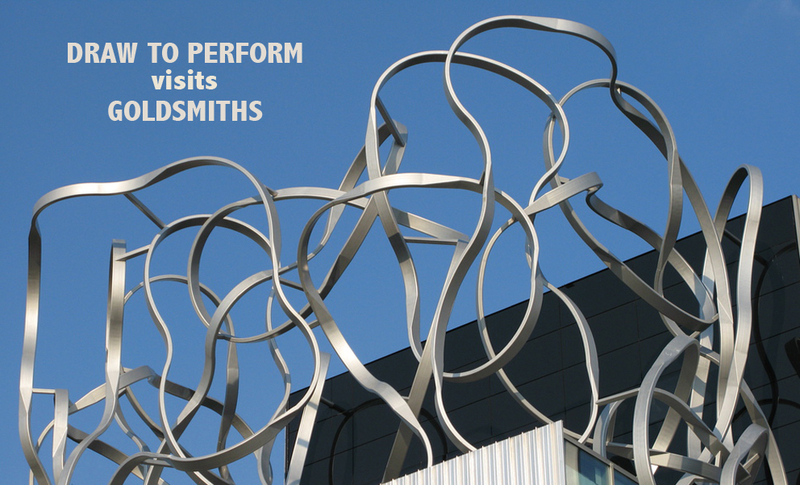 Draw to Perform would like to thank everyone that was involved in bringing this project to the Goldsmiths Design Festival. Firstly Vinny Montag, who initiated and coordinated this great collaboration, Roberto Feo and the department of Design at Goldsmith University for founding and hosting this inspiring event, and last but not least, the wonderful presenting artists Katrina Brown, Rachel Grant, and Poppy Jackson. Thanks for all the talented people that participated at the Draw to Perform workshops, and to the wonderful people who came (even from Belgium) for these two days of Drawing Performance celebration. A three hours workshop about Drawing Performance directed by Ram Samocha. Samocha is a multidisciplinary artist and the curator of Draw to Perform, an international symposium for Drawing performance. Drawing performance is a stream of performance art in which artists create their artwork in front of a live audience while communicating with the viewers. 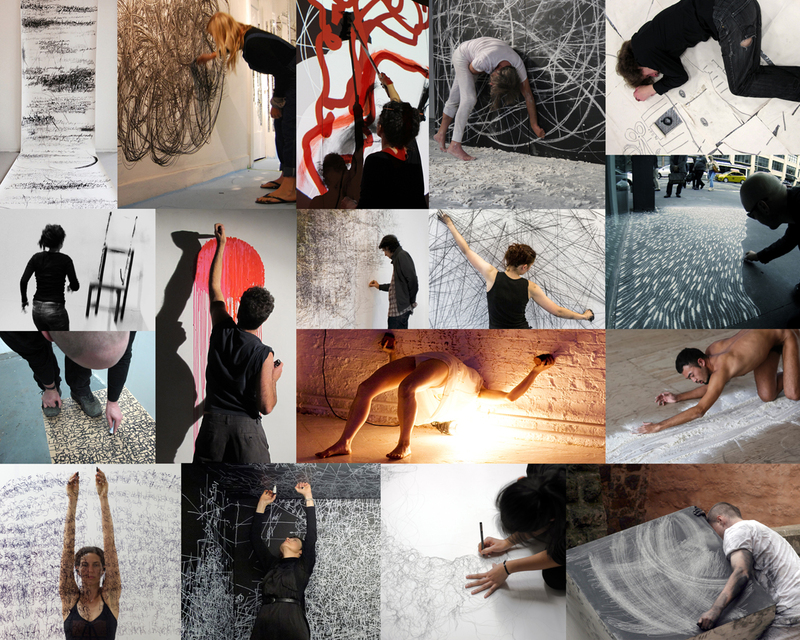 Mark making in drawing performance is often a result of powerful physical gesture and body movement connects elements of line, movement, space and time. The workshop will concentrates on the connection and combination between live action and drawing. It will allow participations to experiment with this practice and talk about possible options of process and presentation. Participating artists will be able to draw live, share and discuss their actions. Materials such as pencils, charcoals, chalks and paper will be provided to all participations in the workshops. BIG THANK U goes to all international and local artists that gathered to participate in the two-day Draw to Perform symposium. All made major effort to come and collaborate and I am really grateful. Big thank you also for all artists who contribute their inspiring videos to be screened at the event. Thank you wonderful drawing lovers and all the people that came to celebrate live art with us at the festival. I would like to thank all those who contributed to the online Indiegogo campaign, truly it would not have happened without you. Thank you Number3London- Michael, Caffy and all the people who hosted this challenging festival and to artist Birgitta Hosea for letting me know about this wonderful creative space in south London. Many more thank you for Fixology silicon and all the sponsors who contributed materials and other support. I would like to thank the Queensland collage of art in Australia and Sunny Purchase Collage in New York, which supported the arrival of the artists Kellie and Jenifer. I would like to thank Bean and the rest of the team in Performance Space. To master Marco for the photos and Andre for the videos. To Ludo and Kamal for the technical solutions. Many thanks to dear Geraldine and Catrine for all their help and to any one I may have forgot. Please support the Draw to Perform2 campaign and donate now. Make it happen! So very happy to announce here the final dates and place of the upcoming Draw to Perform symposium. The venue that will host the next symposium is NUM3ER London. It is a new large space in South London – the new location for contemporary art and artists in the city. The final dates for the symposium are going to be Saturday, May 16 and Sunday May 17, 2015. The first day of the symposium (Sat May 16) will be the live drawing performances. The second day (San May 17) will be the artists’ talks + discussions. More information about participating artists and timetable will be coming very soon.